Check out our video demonstration on how to use WayCap capsules with one of our own blends: Bebop. 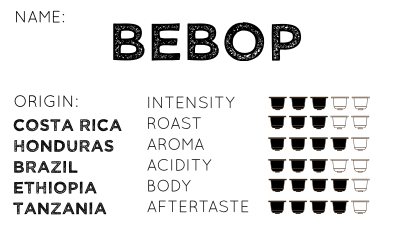 Bebop is our special blend of 5 different 100% Arabica coffees for a clear and smooth-bodied cup. Draw in the limpid floral aromas of this complex blend and enjoy the sweet notes of cocoa in the morning. I Want To See More! WayCap srl - Vat and Fiscal Code: 11406810017 - Companies Register n° TO - 1210861 - © 2019 WayCap. All Rights Reserved.